You may not have ever really given a ton of thought to the little gathering of items you collect over time to cleanse your smile. For as long as you can remember, you’ve had a few things in your bathroom without fail: Toothpaste, a toothbrush, and dental floss. You may occasionally add something new to the mix, like a new toothpaste or a mouth rinse. One day, out of the blue, you may suddenly find yourself wonder: Hey! How old is this stuff? Should I have thrown these things away already? Is this even my toothbrush? Good news: Our Austin, TX team can help you with the management of your dental hygiene products, so you’re never unsure (or accidentally using something you shouldn’t be). 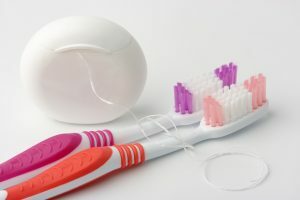 Our team would like to remind you that the first thing to keep in mind, regardless of the products you have in front of you, is that practicing dental hygiene that is its most effective means using your own products. Can you share toothpaste with a loved one? Sure. You should absolutely never share a toothbrush, though! If it’s cold and flu season, it’s a good time to use your own tube of toothpaste. Remember: When you share, you share germs and bacteria. So, why not keep them to yourself? It’s easy! Remember that with the dental hygiene products you’re using that have a shelf life, such as the toothpaste you like and the mouth rinse you occasionally use, they aren’t going to last forever. When you move through a product at a steady pace, you may not have to think too much about this. However, what if you have multiple toothpastes and you alternate? Just remember that all you have to do is check out the expiration date. It will tell you when the item is no longer something you should be using. You want your toothbrush to work its best because you don’t want tooth decay or any other problems that may require restorative treatment! So, if bristles are looking frayed, start over with a brand new one. This is extremely easy: Never use the same toothbrush for a period lasting more than four months! Done. When you aren’t sure about the specifics regarding dental hygiene products, expiration dates, and more, let us know! We can quickly help you sort out the details. Schedule a visit with your dentist in Austin, TX by contacting Austin General Dentistry today at 512-346-5540.